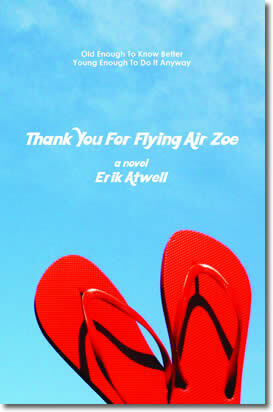 A few months ago I bought a funny, lighthearted novel called Thank You for Flying Air Zoe, and was startled to realize that it was written by... a man. Since we talk so much on Blurb is a Verb about connecting with one's audience, I invited Erik Atwell to drop by for a chat. I wondered--would it be harder or easier to connect with readers in his genre? Take it away, Erik. --S.P. The novel has been out for well over a year now, and I think this particular topic is probably one of its more popular conversation starters. At first, I was surprised that being a male author writing a female-driven novel was such a curiosity. I mean if Alice Sebold wrote The Lovely Bones from the point-of-view of a spirit, and Garth Stein can write a gem like The Art of Racing in the Rain from a dog’s point-of-view, what’s the big deal about crossing a simple gender line? Then I thought more about it. Why aren’t more male author’s writing women’s fiction? Is there some sort of artistic and/or commercial stigma attached to doing such a thing? Well, whatever the case was, the mismatch of the boyish writer with the girly storyline has for sure been a prominent subject on the book review and blogosphere circuits -- one which I am openly happy to chat about. And by now, owing mega-thanks to a ferocious and fun-loving women’s book club in Sammamish, Washington, I am well-versed in this particular discussion. More often than not -- and this spans all the way back to those early years of authorial awkwardness in Fiction 101 at Liberal Arts U. -- I have told stories with female protagonists. And over the years, there have been many theories on why I’ve crossed gender lines. Some have been deeply psychological (“Well, Erik, I think that growing up without a strong female influence, you couldn’t help but try to fill the void by creating such a figure in your work.”). And some have been more blunt (“Dude, I think you need a girlfriend.”) Me personally, I think the answer is simple. And the more I can be both inspired and amused by my characters, the more involved I become in telling their story. While my novel has by in large been categorized as either women’s fiction or chick lit, I don’t so much see it as being wholly gender specific. I think it’s more generation specific -- something that speaks to all of us who lived through the wildly nutty 80s, and have now suddenly entered an ominous new decade that traditionally has signified the cold hard end of youth. Ideally, the substance and heart of Air Zoe doesn’t come from a particular gender, but rather a more universal set of general human musings and concerns. I never actively tried to get inside the mind of a woman for this story -- I just aspired to stay authentic to a tone that was as spirited as it was wistful. See, the dirty secret is, men aren’t so different from women. We are likewise capable of great depth, and often get emotional and inconsolable over absurd things -- like Tom Brady throwing three second half interceptions in the AFC Championship Game, for example. Please hold. I need a minute. So let’s go back to my now legendary book club appearance in the Pacific Northwest... At the festivities, one of the women confessed that she’d gone into the book ready to unleash mayhem if I misrepresented what it was like to be a woman. Fortunately, the story won her over just enough that I was able to escape unscathed, and we were able to laugh about it. I think what she most appreciated about my reply was that while I certainly hoped to accurately depict a 40-something woman, what I most aimed to do was remain true to the emotions, hopes, fears, and flaws of humankind in general. If I was in fact lucky enough to succeed at gracefully and accurately writing a female main character, it was not because I was able to crawl inside the mind of a woman and understand their innermost thoughts. It was because I saw her as no different from me -- apart from body parts and chromosome patterns, of course. With Air Zoe, I shrewdly stayed in my creative comfort zone. I wrote what I knew internally, if not externally. I suppose in a roundabout way, I can relate to this guy. Was I ever in an all-girl 80s garage band? No, but I did have a crush on three-fourths of The Bangles. Sometimes inspiration can come from anywhere, y’know? You can read more of Erik Atwell at www.erikatwell.com.